* New for 2017 - all cottages now come with satellite TV. * New for 2018 - all new high quality pillow top mattresses in every cottage. Our eight freshly renovated deluxe housekeeping cottages are fully equipped and offer a semi-private atmosphere, sheltered from the prevailing winds and all offering a view of the water. 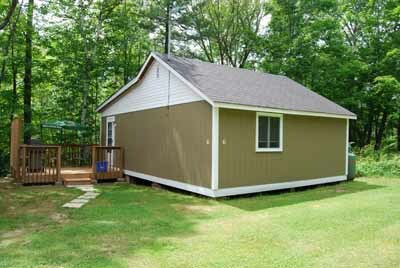 Take your pick of a two or three bedroom, with enough space in the largest cottage to accommodate upwards of 8 people comfortably. 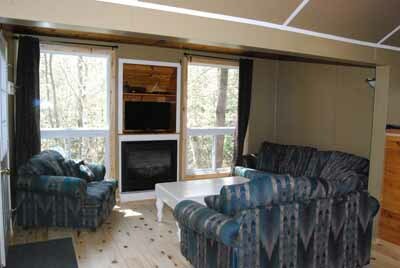 We pride ourselves on attention to detail, because for one week of the year, this will become your home away from home. 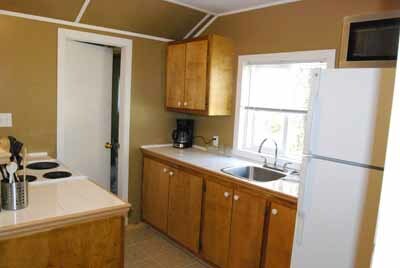 Our modern cottages offer full conveniences to our guests, including such things as 3 or 4 piece bathrooms, a full kitchen stocked with dishes, pots, pans and cutlery, new appliances, as well as a toaster and coffee maker. We provide all pillows and linens but our guests must supply their own blankets/comforters and towels/cloths. 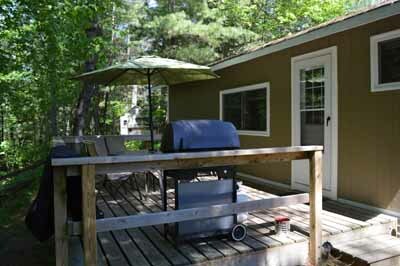 Preparing meals has never been easier, especially when a private deck, propane BBQ and patio set is provided for each of the eight cottages. Although our lodge is strictly housekeeping there is plenty of opportunity for everyone to mingle and get acquainted with the other guests around a campfire, the pool, the recreation hall or any of the other common areas. If there is anything we can do to make your stay more comfortable, please feel free to ask. Chances are we have just the item you might be searching for. Select "Rates" above for pricing per night or per week. 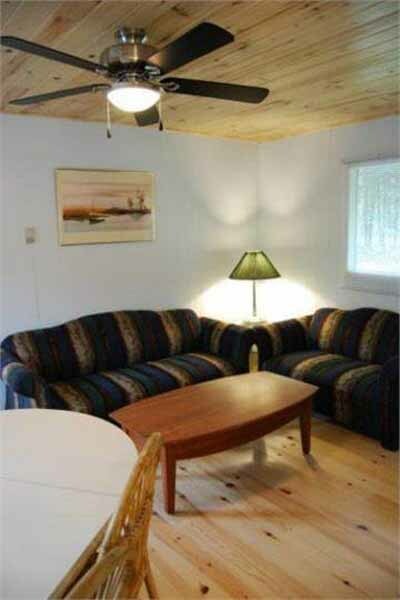 Cottages 1, 2 and 3 are 800 square feet and feature 3 large bedrooms, 3 piece bathrooms, propane furnaces and electric heat, spacious kitchens in addition to large dining and sitting areas. 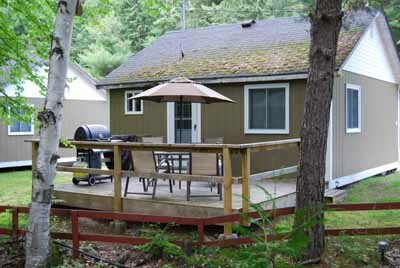 Cottages 4 and 5 are 400 square feet and feature 2 bedrooms, 3 piece bathrooms, gas fireplace and well appointed kitchens. 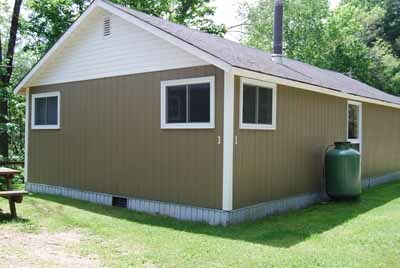 Cottage 6 is 580 square feet and features 2 bedrooms, 3 piece bathroom, gas fireplace, huge kitchen in addition to a large dining and sitting area. 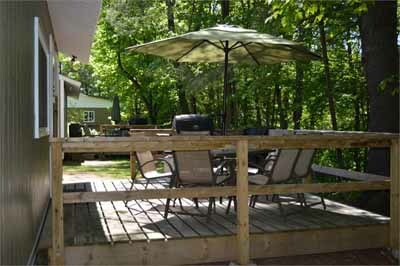 Cottages 7 and 8 are 512 square feet and feature 2 bedrooms, 4 piece bathrooms, gas fireplace, well appointed kitchens in addition to large dining and sitting areas. Our eight freshly renovated deluxe housekeeping cottages are fully equipped and offer a semi-private atmosphere, sheltered from the prevailing winds and all offering a view of the river. Take your pick of a two or three bedroom, with enough space in the largest cottage to accommodate upwards of 8 people comfortably. 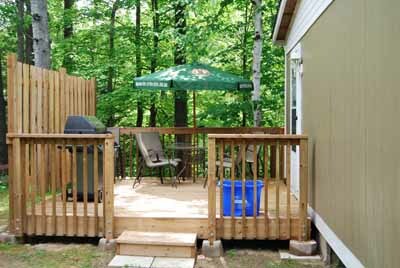 We pride ourselves on attention to detail, because for one week of the year, this will become your home away from home. Select "Rates" from the menu above for pricing per night or per week.